What better way to get children to connect with nature than to take the classroom outdoors! 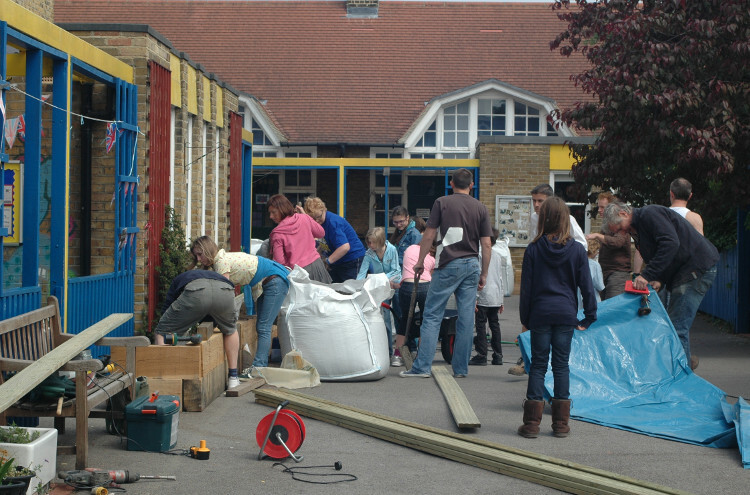 Father Nature has been building outdoor classrooms and fun food growing areas in local schools and children’s centres around Lambeth and south London since 2011. The positive feedback from the kids, parents, teachers and facilitators has been overwhelming. Read about our work at Sudbourne School below or visit our Gallery to see some of the work we have done with other schools. 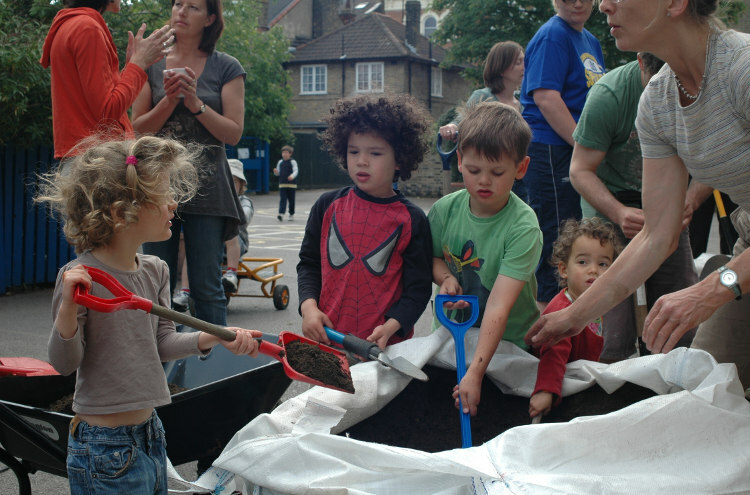 Father Nature is a member of Learning Through Landscapes and works in partnership with Natural Thinkers, and Sowing the Seeds (part of the London Sustainable Development Commission) all of which are focused on connecting children with nature. 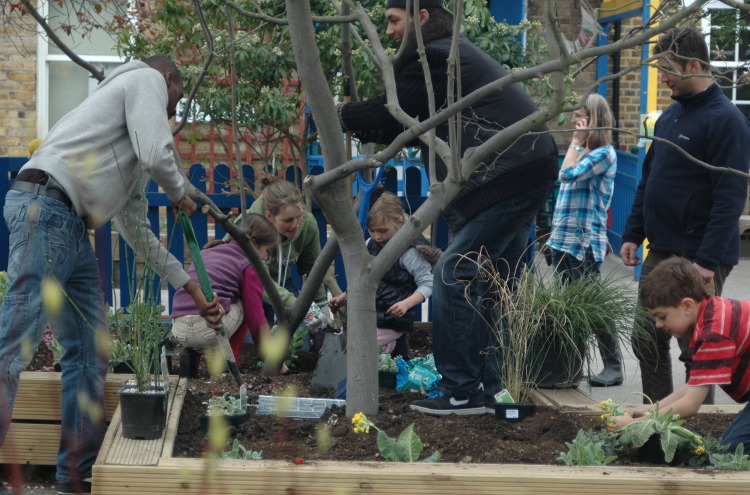 Father Nature holds Lambeth recommended status as a landscaping provider of Outdoor Growing & Learning Spaces. 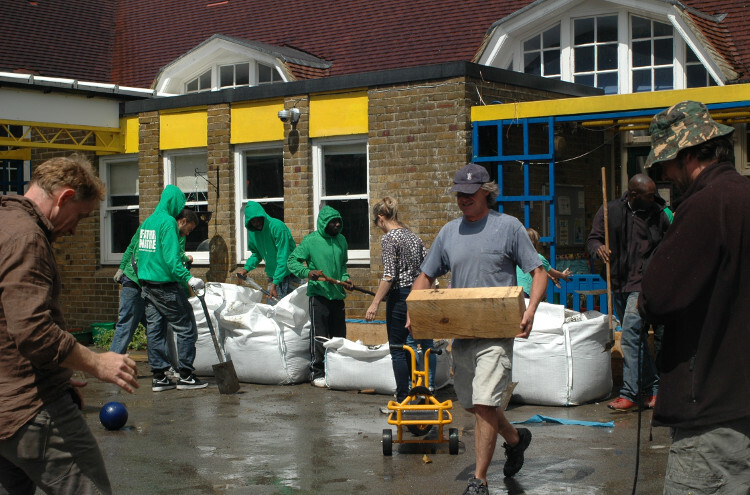 Since 2011 Father Nature has completed outdoor classrooms, developed the outdoor areas or created road safety planters for Allen Edwards School, Boutcher Primary (Southwark), Durand Academy, Heathbrook Primary School, Immanuel Primary School, Jubilee Primary School, Lark Hall School, Maytree Children’s Centre, Peter Hills School (Rotherhithe), Richard Atkins Primary School, The Spinney at Clapham Common, St Helen’s Catholic School (Brixton), Stockwell Primary, Sudbourne Primary School, and Wellingtons Nursery (Wandsworth). Current projects include five more projects in Lambeth and Wandsworth. If you would like to visit one of our completed Outdoor classroom sites then we will happily arrange a visit. Please call our landscape designer Crispin Swayne on 077962 41970 or email us at [email protected]. How will an Outdoor Classroom benefit my school? An outdoor classroom, filled with covered learning areas, secret dens, mud kitchens, bug houses, play equipment made from natural materials, raised beds and greenhouse for growing fruit and veg, pizza oven, composter and irrigation system for plant health – all this will become your school’s best resource for outdoor play and learning about nature, food growing, healthy cooking and eating and sustainability. Father Nature keeps the national curriculum in mind at all times and will build your school an outdoor space that will give your teachers a platform to bring life to any subject be it Science, English, Maths or Design & Technology. Pupils learn well outdoors and Ofsted and the Council for Learning Outside the Classroom rightly promote outdoor learning based on wide research that children benefit at every level with improved health as well physical, emotional and social skills. As a supporter of the aims within Healthy Schools, Father Nature works to help schools improve the well being of inner city children. 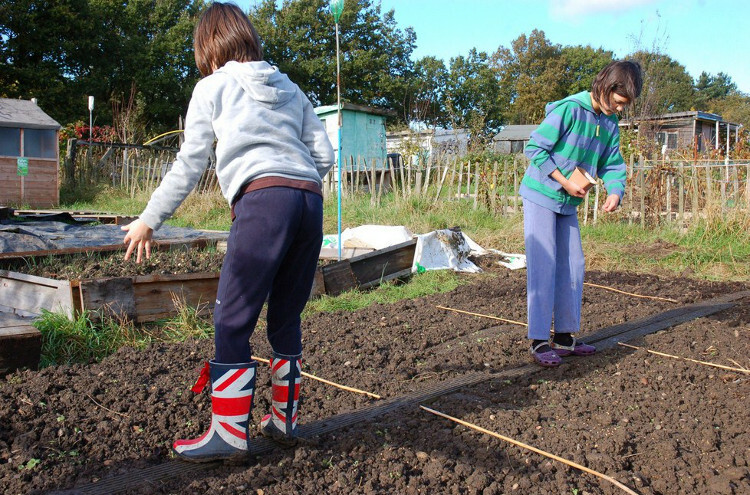 Giving your pupils the opportunity to play outside and grow their own food improves their relationship with nature and increases their knowledge of healthy eating. Our partnership programme with local restaurants means we can also offer a visit from one of Lambeth’s many up and coming chefs to demonstrate healthy cooking with recipes to reflect the children’s harvested crops. 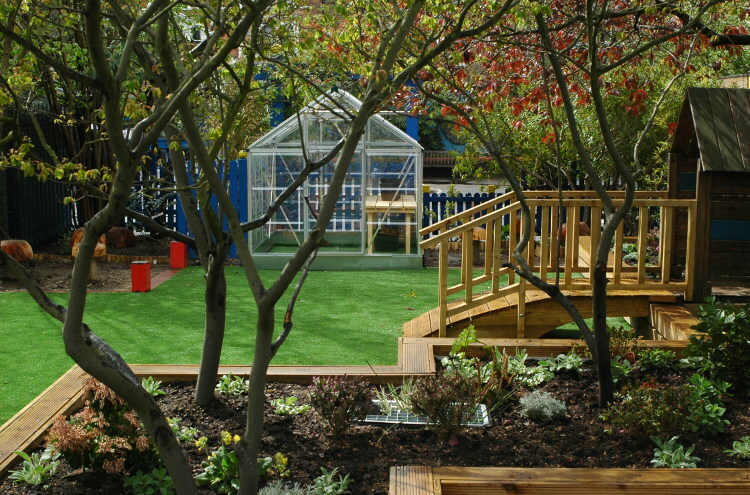 An outdoor learning and growing area in your school shows your commitment to sustainable city life, as well as to the future good health of your pupils and staff. Our experience shows that once the pupils get into gardening, their parents and carers are soon to follow, extending your school’s influence deeper into your local community. We make it our business to get everyone stuck in whether it’s helping Father Nature prepare the site at a Community Build Day or digging in the new plants at the grand finale Planting party. Last but not least, kids love our outdoor classrooms! Father Nature can help make learning about nature and healthy living into a rich interactive experience that will stay with your pupils all their lives. PS. They also love the Father Nature milk float which carries all our tools and staff! How much space will we need? Father Nature can build to whatever vision or space you have, be it large or very small. Our landscape designer Crispin Swayne will work closely with the school to make the very best use of what space you have available. How much time will we have to commit? Does your school have a green fingered teacher amongst the staff? If not, don’t panic as Father Nature offers your staff free training once a month for a year at your school or one of our other growing sites. Hands on learning includes seasonal planning, sowing, planting, harvesting, wildlife awareness and composting know-how. Your trained staff can bring their knowledge back to the classroom to share with the children and other teachers to devise fun outside projects including garden maintenance. 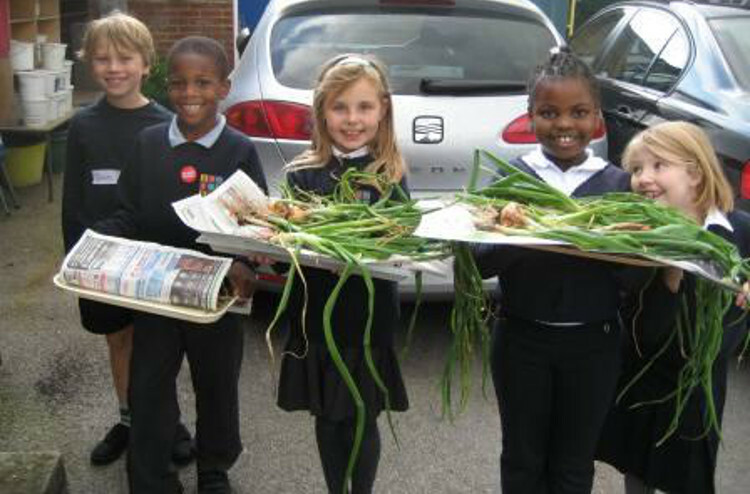 Other ways to share and enjoy care of the garden is to introduce an After school Gardening club. 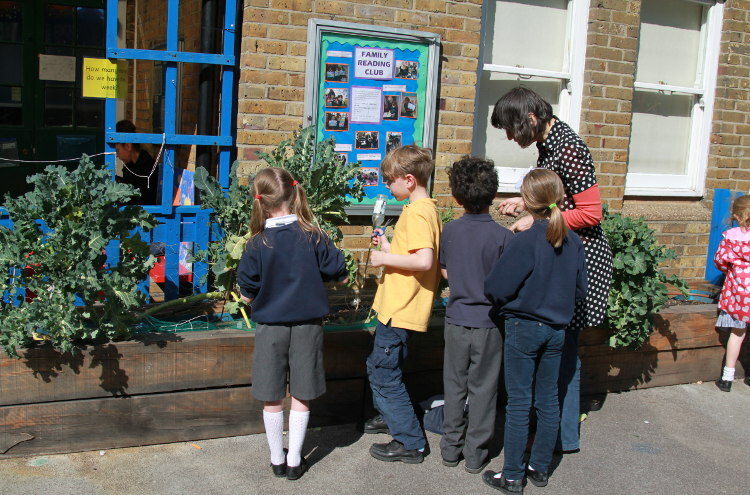 We find that ‘Planting Parties’ or ‘Gardening Days’ and ‘Harvest Days’ where parents and carers can come into school to support their children’s growing projects are highly successful and rewarding. If no one teacher is available to rise to the challenge of being your school’s ‘Horticulture Hero’ then Father Nature can step in and provide a Maintenance package to ensure the outdoor areas continue to flourish. What support does Father Nature offer us? • Our approach is very hands on, sharing our design know-how, community engagement skills and gardening knowledge from start to finish. We strive to offer every schoolthe tailored help they need. • We consult very closely with staff, governors, pupils and parents/carers to create the best outdoor classroom tailored for your school’s specific needs and goals. Community engagement is a vital part of our work as we find that engaging all the stakeholders – young and old – before, during and after the final plans go ahead ensures not only the right design but also a sense of communal ownership, and most importantly, longevity of interest. • Once the consultation phase is over we provide professional, clear design plans to ensure that the whole school can envisage the future outdoor classroom and make final suggestions. • We offer a bespoke growing plan for your school and strive to source you free or low cost sustainable materials, plants and soil. • We are on hand to help organise or attend ‘Planting parties’ and ‘Gardening Days’ to encourage parents and carers into the school. We can even help you set up a regular School Farmer’s Market (see Food for Life) which can raise as much as £300-£400 each time for the school. • We support all the staff in their aims to incorporate the Outdoor classroom into core curriculum learning and teaching plans. • Father Nature offers support with finding funding and grants, as well as publicising gardening related events for the school. • Father Nature can offer you access to some of Lambeth’s local chefs who work with us to bring foraging and healthy cooking workshops and demonstrations into your school. 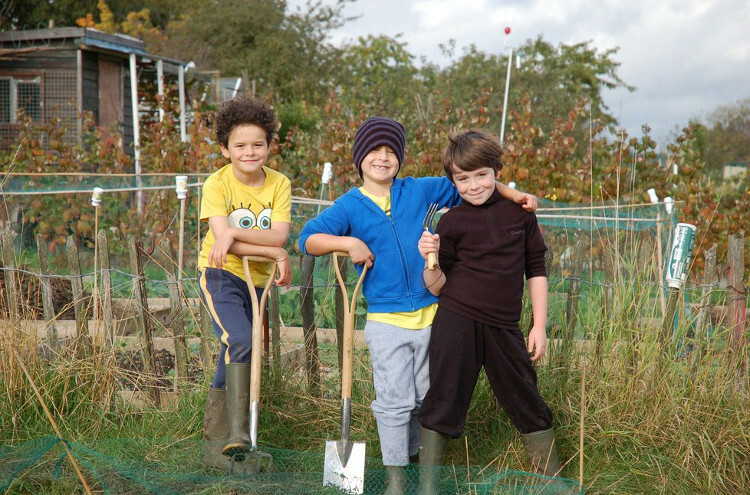 • Once we have built your Outdoor Classroom, Father Nature will invite you into our online Father Nature community group where other schools and local growers can offer you support and advice, as well as keep your school informed of upcoming horticultural and outdoor play events in the Borough. * Father Nature can support your school to become an Eco School whether you wish to apply for Bronze, Silver or the coveted Green Flag. * We can also support your school in gaining Accreditation from the Council for Learning Outside the Classroom. We are happy to work with small budgets as well as large and will do our best to source low cost quality materials where we can to make your money go further. We are happy to make low cost improvements to your outdoor play areas such as a mud kitchen, tree house or to help your pupils build a pizza oven. For larger projects, however, the average cost is from £10,000 which includes design, project management, community engagement and consultation, materials and construction, publicity and online Father Nature group membership. We can even incorporate aspects into the design that will make the site attractive for hire by third parties, making your investment start to pay for itself. We offer separate prices for supplementary Garden Maintenance programmes, one-off gardening events at the school, and Chefs Visits. Can our school get funding? Whilst your school is responsible for the cost of the initial consultation and design for the project, Father Nature is well practiced at helping schools find external funding or grant sources for the later phases of the project. Project Dirt, Grants4Schools, Funding Education, Learning Though Landscapes, Gregg’s Foundation, the London Community Foundation, Tesco’s Bags of Help, Teratrees, the Walcot Foundation, and (if you live in London) the Major of London’s ‘Crowdfund London’ programme are also useful sources of information for access to funding. If you would like your school to have an outdoor classroom or some fun food growing areas then write to us at [email protected]. Sudbourne School… From ‘Seed to Supper’. At Sudbourne Primary School Father Nature liaised with the amazing staff there to help the children get a hands-on grasp of the ‘growing cycle’ of food from seed to supper. Firstly came the outdoor classroom, which was designed by local architect Polly Waterworth and Crispin Swayne and built in the playground using natural materials wherever possible, constructed over a few weekends with the help of pupils, parents and carers and Father Nature volunteers. Then learning benches, dens, a greenhouse, plants, an irrigation system, composting bins, a frog-friendly pond and plenty of ‘bug houses’ were installed at a massive ‘planting party’, followed by the grand opening. Later, raised beds were built outside each classroom where the pupils planted then tended their own vegetable crop. (Father Nature are the masters of planters! No matter how awkward the space, if it gets the sun, we’ll build you a raised bed there!) Come the autumn term the children harvested the yield and parents and carers came to help the kids cook up the crop into an edible feast. Father Nature even managed to secure some space at Rosendale Allotments where the children grew a wheat crop which they later took to Brixton’s Windmill to be milled and then baked their very own Sudbourne bread.